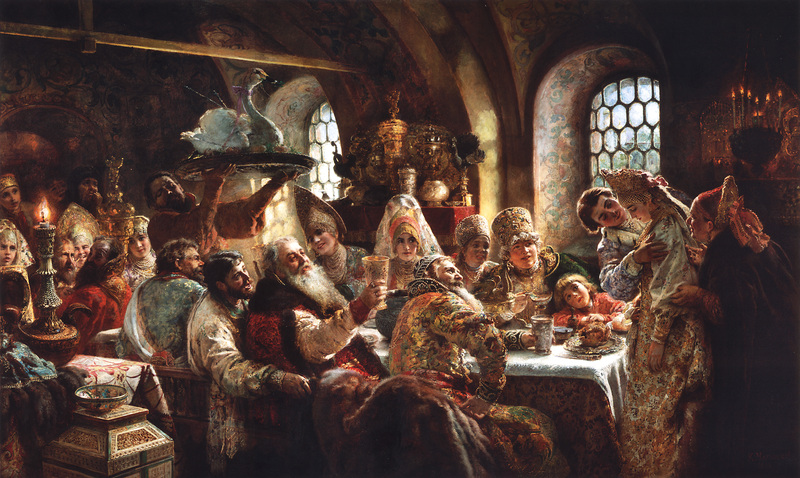 The painting depicts a Russian aristocratic wedding in the 17 century at the moment when the guests toast the bridal couple with the traditional chant of “gor’ko, gor’ko,” meaning “bitter, bitter,” a reference to the wine, which has supposedly turned bitter. The newlywed couple must kiss to make the wine sweet again The women are wearing pearl-studded kokoshniki’s, a typical headdress. Also, note the roasted swan about to be served, the last dish of the meal.